The all-new DVD movie Curious George 2 hit store shelves on March 2nd. My children always have disagreements, but one of the few things they can agree on is that they love to watch Curious George on PBS. Even the adults in the house will never turn down a chance to sit down and watch this endearing monkey's antics. Curious George 2 tells the tale of how George wants to reunite his new elephant friend named Kayla with her siblings who live on the other side of the country. This movie includes some big name celebrities, such as Tim Curry, Jerry Lewis, Matt Lauer, and Jamie Kennedy. This DVD includes several bonus features, such as two never-before-seen episodes of Curious George that will not air until Fall 2010. There are also games, puzzles, a music video with clips from the movie, and free coloring pages and wallpapers. I think the new episodes were the biggest treat of all for my children. This movie has two main themes. The first is that one can achieve anything with enough determination and help from friends and family. The second, which seems to be aimed more at the adult viewers, is that sometimes priorities get to be out of order and career ambitions overshadow the importance of spending time with one's family and loved ones. The first Curious George movie was a tough act to follow. As an adult, I found the villain in this sequel to be more ridiculous than evil, but I know that my children disagree. All three children thoroughly enjoyed the movie. There is always so much to see and our 3yr old son likes to point out everything to us. Our 6yr old son could not help but laugh and giggle out loud, especially when George was being extra silly. I think this DVD would be a great alternative to candy in the Easter basket this year. Any Curious George fan would enjoy it and it is a movie that the whole family can watch together. You should be able to find this DVD most places where children's DVDs are sold. Thank you to Click-Communications for sending us a sample DVD free of charge to base this review upon. Thank you to 360i for providing the gift pack for our contest prize on behalf of Universal Home Entertainment. 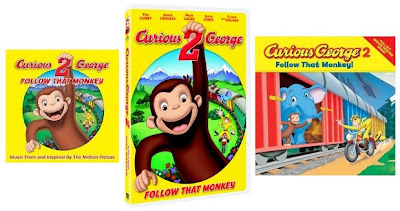 One lucky reader will receive Curious George 2 Prize Pack (a DVD, the soundtrack on CD, and a storybook). Watch the trailer found in my review above. Then leave a comment telling me who in your life would love to own the Curious George 2 DVD. You MUST do this to be eligible to win this contest. 3) For 10 extra entries, blog about this contest linking back to this post AND CuriousGeorge.com . Then come back here and leave TEN separate comments with the link to your blog post. This contest ends on Thursday, March 18th, 2010 at 11:59pm EST. A random number drawing will be held shortly after. The winner will be announced here and will be contact via email or through their blog. If the winner does not respond within 48 hours, a new number will be drawn.